You may be wondering why is it that Bestow doesn’t require medical exams when traditional life insurance companies do. The short answer: big data and technology. But, we also understand that you want to know more about us (#flattered). So, without further ado, here’s our long answer. 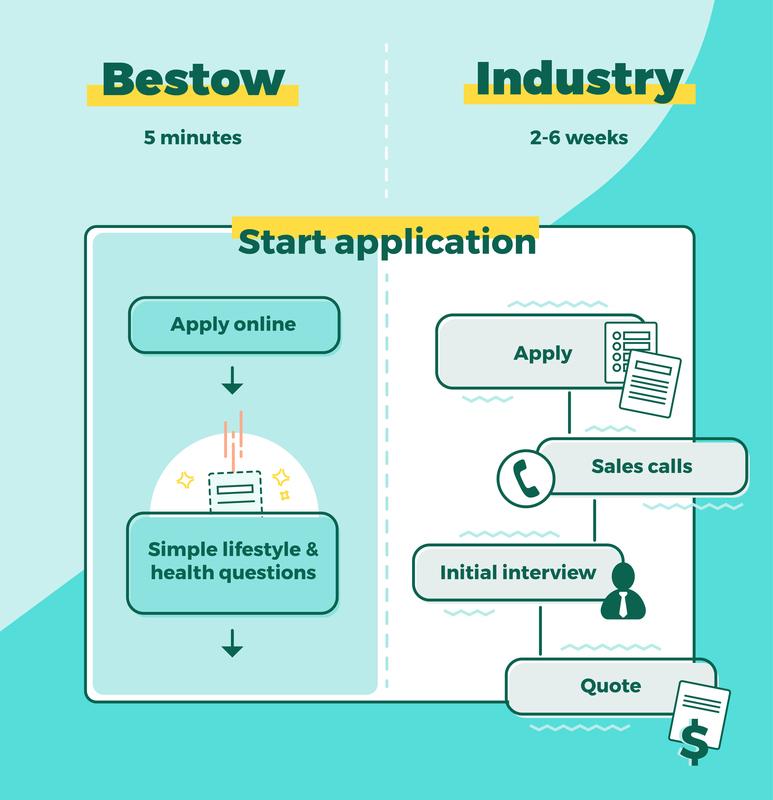 Applying for life insurance with Bestow is easy. Our online form asks questions about your lifestyle and health. Behind the scenes, our big data and technology secret sauce analyzes your application. No doctor’s visits or needle pricks here. 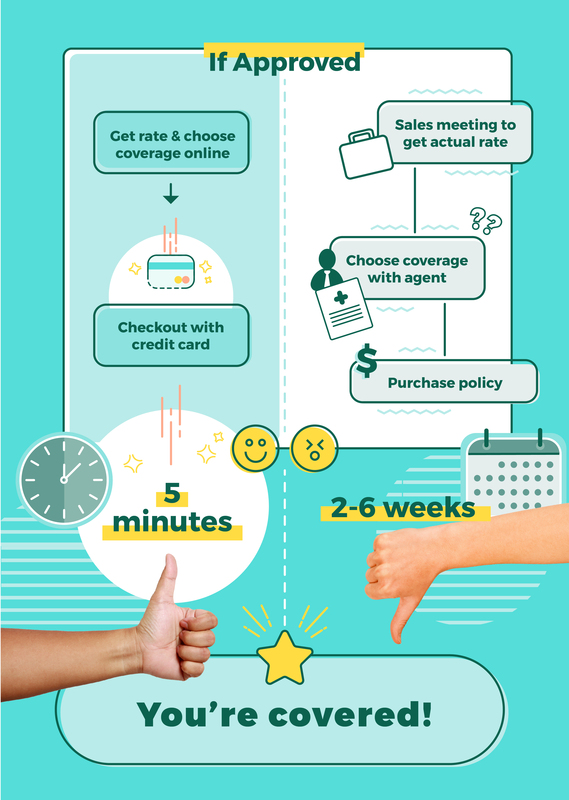 If approved, select your policy term and coverage amount, then voila! You’re covered. No paper forms. It’s all 100% online. The whole process takes just a few minutes. Really. We told you it was easy. What Kind of Insurance Does Bestow Offer? While there is a wide array of life insurance products out there in the world, the product we chose to offer first is term life insurance. Term life is one of the most well known life insurance products on the market, and for good reason. It’s simple and much less expensive than other types of policies. Pay a set monthly premium throughout the duration of that term. None of the above changes, unless you cancel and purchase a new policy. Does Bestow Require a Medical Exam for Life Insurance Coverage? 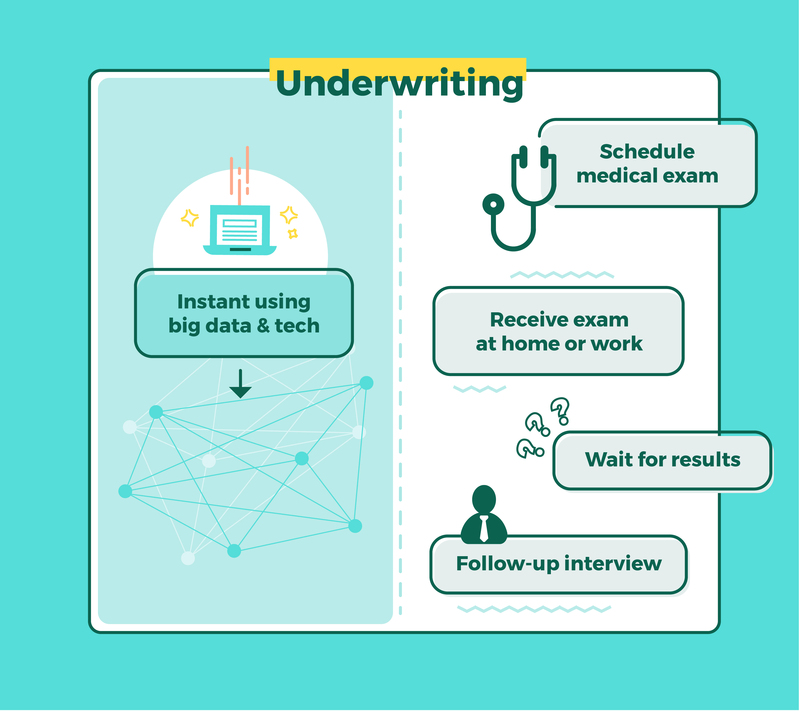 We’ve swapped the medical exam for big data and technology (more below) to make buying a term life insurance policy super instant, convenient, and affordable. What is Bestow’s Big Data and Technology? Big data, as in databases. We’ve partnered with third-party agencies to gather information in order to assess your risk and eligibility for a life insurance policy. We check your social security number, address, and other publicly available data to make sure you’re you. We’ll also get information about your prescriptions and other health data through a variety of sources, like MIB. These are all pretty standard for life insurance companies. However, it’s our technology that sets us apart. What Makes Bestow’s Technology Different? Unlike other online life insurance providers, we underwrite our policies in-house with our own technology — accelerated underwriting. In traditional life insurance, lengthy paperwork, medical exams, and in-person interviews are part of the underwriting process. This is what has made buying life insurance a chore in the past. Humans are very much involved in your risk assessment, and while we love humans, this leads to dragging along the insurance shopping process for several weeks just to get a rate. If you don’t like it, you have to start all over again with a different company. No thanks. In-house underwriting is unique. We’ve replaced humans with algorithms to provide you with an underwriting decision in about 5 minutes. If approved, you’ll see your real premium (no insurance quotes here!) and can buy that policy on the spot. Think of this accelerated, algorithmic underwriting as our secret sauce. We use that aforementioned big data and our proprietary technology to assess your risk and eligibility instantly. 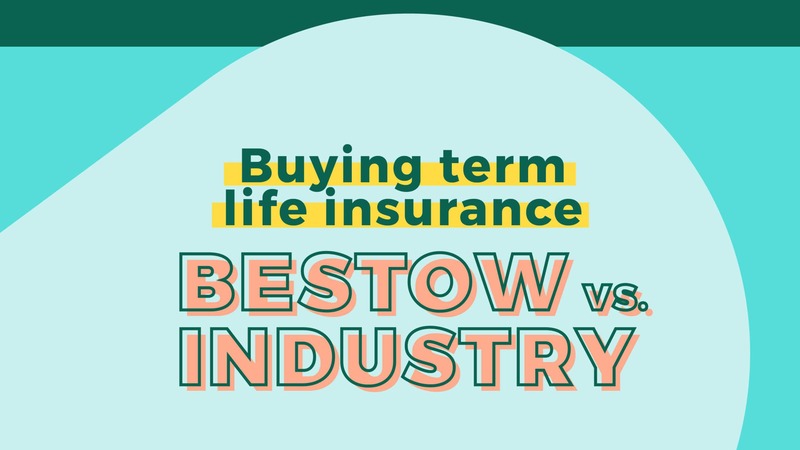 Is Bestow a Life Insurance Company? North American Company for Life and Health Insurance® – They’ve been around since 1886, have more than 595,000 life insurance and annuity policies held, and have over $22 billion in assets. They’re rated A+ (Superior) by A.M. Best with a stable financial outlook. Munich RE – They’re one of the largest reinsurers in the U.S. They were founded in 1959 and offer life and disability reinsurance to insurance companies. They’re also rated A+ (Superior) by A.M. Best with a stable financial outlook. Good to know: A.M. Best is the oldest and most widely recognized provider of ratings and provides financial stability outlook reports on insurance companies and the rest of the industry. Rest assured, your coverage is covered. Is Bestow’s Life Insurance for Everyone? If you love online shopping and hate sales pitches, then yes, Bestow could be a great fit. We’re also unable to extend coverage if you have one of the following health conditions: heart disease, stroke, cancer (except basal and squamous cell skin cancer), organ transplant, diabetes before 40 (except gestational diabetes), alcohol and drug abuse, HIV, or kidney disease requiring dialysis. We’re constantly working on expanding insurability, so if don’t qualify for a policy with Bestow right now, check back with us again in the future. Do Bestow’s Insurance Agents Receive Commissions? Our customer care advisors are licensed life insurance agents, but they work commission-free and aren’t here to sell, or upsell, you anything. Have a question about coverage? Need some advice? Our team is ready to take your call. And if you really don’t want to speak with a person, you can reach us online, too. What Else Should I Know About Bestow? We’re on a mission to make life insurance more accessible. We’re helping families protect their financial futures with products that are affordable, hassle-free, and on demand. Just fill out our simple online form, and you’ll have an underwriting decision by the end of the application. If approved, you can have your own individual life insurance policy in minutes — no human interaction required. Interested? Apply for coverage today.